At the end of August 2018, Starkey Hearing Technologies introduced a new hearing aid that is changing the way people look at hearing healthcare. Hearing aids have always been intended to improve the user’s quality of life by making it easier to hear and communicate. Starkey has taken it a step further by creating a product that not only helps you hear better but also helps you reach physical goals and encourages you to be more socially active. The new Starkey Livio AI (Artificial Intelligence) has built-in sensors to track your physical activity and Artificial Intelligence that monitors your social interactions to determine your cognitive health. With these features, the hearing aids now work to increase your overall health and wellness, while also giving you an excellent hearing experience. If that isn’t enough, the hearing aids also have the ability to translate language in real time and can be programmed by your hearing care professional from any location. Whether it’s understanding your German waiter at a restaurant in Berlin, or requesting a hearing aid adjustment remotely from your hotel in Mexico, your hearing aids are now your biggest asset while travelling. Starkey has definitely pushed the hearing aid industry forward by introducing a product that has so many practical features while staying true to its primary focus of better hearing health. Here at Living Sounds, we are so excited to share this new technology with our clients. Providing people with better hearing has always been very rewarding, and I know it will be even more so now that we can offer a solution that will impact our client’s physical and mental wellbeing in such a unique way. 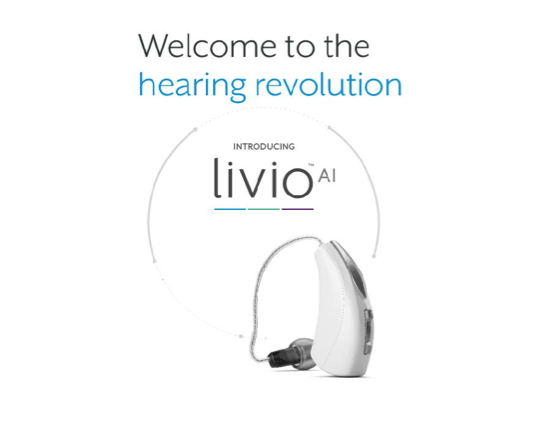 Come to any of our Living Sounds locations and try out the new Starkey Livio AI hearing aids for yourself!